Welcome to Fish Window Cleaning! After being in business for over 30 years, we have now expanded in the Charleston Huntington, WV, area to make it a brighter place. Let a premium, award-winning window cleaner show you how we shine. We provide window cleaning and pressure washing service from Belle to Huntington and everything in between. Let us do the hard work and Brighten Your World! May 2015: This is a great time to get on our schedule for summer! We also provide gutter cleaning and pressure washing services! We'll be happy to provide free estimates for all of our services. Just give us a call today! "You want timely, reliable service from someone who really cares about your satisfaction and who has pride in their work. With Fish Window Cleaning, that's precisely what you'll get." Cleaning all of the windows in your home - inside and out - can be difficult, time consuming, and even dangerous. Don't spend any more of your free time up on a ladder trying to make your windows streak-free and sparkling. Let Fish Window Cleaning take care of that for you! We clean all types of windows in the Charleston Huntington, WV, area. We wear clean shoes covers while inside your home and use cloth pads under your windows as we clean to protect your carpet or wood floors. We work quickly since your time is valuable and we work quietly so we don't disturb you or your family. We even use environmentally friendly cleaning products so you are not subjected to harsh fumes! You'll be pleased with our service and you'll love your sparkling clean windows. We also provide pressure washing and gutter cleaning services! Scroll down for more information about pressure washing. Click here for more information on our residential services. We maintain the appearance of storefronts, restaurants, and other commercial buildings in the Charleston Huntington, WV, area. We help you achieve a polished and professional look that will give your customers an outstanding impression. We provide cleanings ranging from weekly to annually, meeting your specific needs. Regardless of your schedule or budget, we can put together a program tailored for your business. Our safety program leads the industry and ensures the protections of our cleaners as well as our customers. We also provide that extra peace of mind that licensed, bonded, and insured window cleaners are maintaining the appearance of your business. Don't forget about your sidewalks, parking lots, and patios! We also provide pressure washing services. See below for more information. Click here for more information on our commercial services. Why stop with clean windows when you have dirty sidewalks, awnings, and patio areas? Let us remove the cobwebs, grease, mold, gum, or whatever else is keeping your property from looking its best. 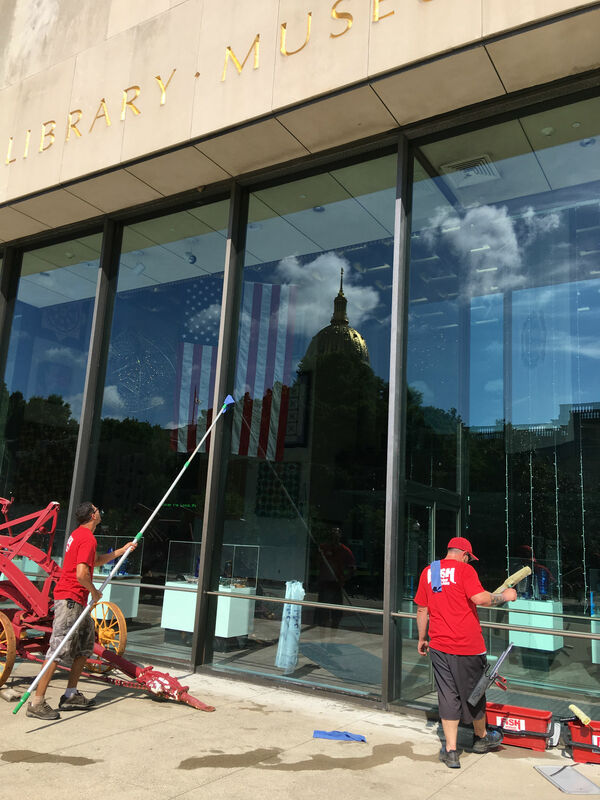 Our licensed, bonded, and insured pressure washing professionals can clean and brighten the entire exterior of your property instead of just cleaning the windows. 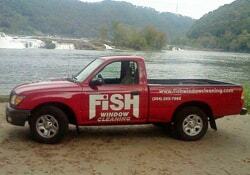 Let Fish Window Cleaning be your one stop shop for exterior cleaning. Click here for more information on our pressure washing services. Why have we grown to be the largest window cleaning company in the world? Let us come by and give you a free on-site estimate. It would be our pleasure to add you to our list of satisfied customers. Serving the Charleston Huntington area and everything in between.